This Part 2 gives other ideas for table decoration and menu to build upon last week’s Easy Entertaining: Take Out Chicken Dinner Party. The boho vibe to this table is a fun and simple one to achieve. Flowers are just a bouquet of inexpensive mums picked up from my local florist that I placed in a decanter that matches the tumblers shown. It literally took 3-4 minutes to complete the arrangement. 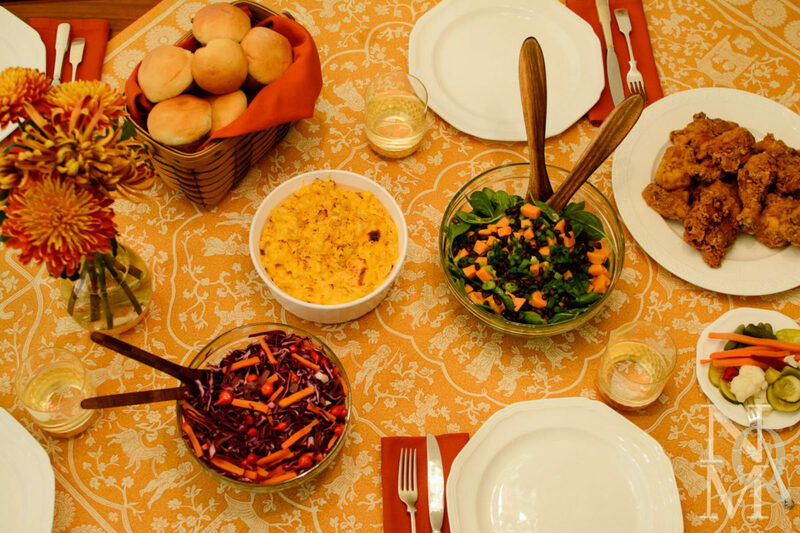 The tablecloth is a square topper that was placed on the diagonal and I chose rust tone napkins to pick up the warmth of the flowers and tie together the different orange tones of the menu (chicken, the sweet potatoes from the green salad, and carrots in the cole slaw). Remember to try the NQM Sweet Potato Black Bean Salad! It’s such a nice addition and so easy to make. I set the table with my everyday plates and flatware and slightly elevated the look with gold trim tumblers (sources below). I hope these ideas help you use what you have, maybe add an item or two to your table decor arsenal and invite friends over soon! Remember that people won’t remember much of the details about food, they mainly feel gratitude for friendship and the chance to connect and laugh over a meal. Keep things simple and relax! *This contains some affiliate links but only if No Qualms Mom thinks highly of the product or service. While NQM may receive a small commission from some sellers if you buy from them, know that using my links does not affect your pricing in any way. And many NQM links are purely information—listed only to help you. Ambiance Trifecta: Music, Candles, and Flowers—Oh My!